The town of Căpleni (German: Kaplau, Hungarian: Kaplony) is located on the shore of Crasna River, four kilometres north of Carei and 40 kilometres south of Satu Mare. Căpleni was first mentioned in 1212 as an estate of the Kaplony family. Later, it became a hereditary possession of the Károlyi family. Căpleni was one of four settlements belonging to the Count of Károlyi, all of which were completely depopulated after the Kuruc Wars. Therefore, the Count brought Swabians to Căpleni in 1712, one year after the Peace of Satu Mare. The settlement proved difficult, though. Many of the colonists moved to other villages and some returned to Swabia. The German population of the region of Satu Mare decreased drastically after the deportation to the Soviet Union, which only affected the German residents of Romania. A massive migration wave in the 1990 lowered the numbers further, so that only few Swabians live in Căpleni today. The town is located on the drained moorlands of Ecedea and many traditional occupations of the inhabitants were connected to local resources. Thus, Căpleni was a centre of willow braiding. After the moors were drained, most inhabitants worked in agriculture. Căpleni’s main attraction is the monastery, which was donated by Count Károlyi. Local records say it was founded in 1080, when the estate still belonged to the House of Kaplony. The first written record of the monastery stems from 1268. In the 15th century, it was abandoned and only reopened as a Franciscan Order in the 18th century on the initiative of Count Sándor Károlyi. The earthquake of 1834 destroyed the church and several other buildings. Plans for a reconstructed monastery were designed by Miklós Ybl. 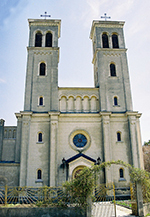 The church was restored between 1841 and 1848 and consecrated to Saint Anthony. The architectonic ensemble includes the crypt of the Károlyi family. Here, 36 members of the family that shaped the region in the 18th and 19th century are buried. The most well-known of them is Count Sándor Károlyi, who initiated the Peace of Satu Mare. He also organised the settlement of Swabians from Württemberg in the region and is one of the most famous figures of the area. 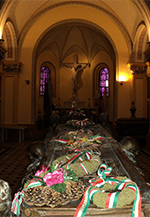 Tomb of Count Sándor Károlyi. The count is commemorated and honoured until today. 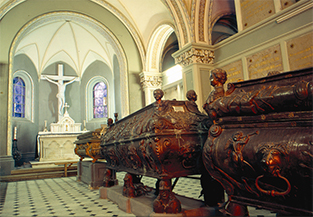 LEFT: Crypt of the Károlyi family. RIGHT: The Franciscan monastery church, consecrated to Saint Anthony.